The stabilizer muscles in the shoulder girdle are of utmost importance because they determine the strength and power of your arms. If these muscles turn weak, they will increase the risk of injuries and strains. Include specific exercises to strengthen these stabilizer muscles which will help in building flexibility, will keep your shoulder and back muscles toned and will help in your overall fitness. Bodybuilders and weightlifters should specially consider these stabilizer muscles in their daily routine to reduce problems of winging and stabilize the scapula muscles at the same time. Here Are 6 Exercises To Strengthen The Stabilizer Muscles In Shoulders. This exercise helps in strengthening and adding power the serratus anterior. It helps in strengthening the muscles located deep in the shoulders. You need to hold one stability ball just against the wall. It should be at your shoulder height. You need to position this ball on one hand as you maintain a good pressure on this ball. You will be moving your arms in a clockwise and an anticlockwise direction. This shall be like an 8 figure movement. You need to start doing this workout for 15 seconds at a stretch for one arm and then you can increase this duration as per the strength you feel. Start the exercise by lying down as you keep your face down. Your arms will make a V shape in front. As you slowly point your thumbs up and you are able to raise your arms from the ground, you can easily squeeze your muscles in the upper back. You need to do this movement for at least 12 repetitions. You can then move your thumb downwards and do 12 more repetitions. In the end, you need to slowly bend your arms and make a 90 degree, as your thumb is pointed up. You can then raise the arms slowly as you will be squeezing the scapula for at least 12 repetitions. This will help in strengthening the stabilizer muscles of your shoulders. This exercise is excellent for the stabilizer muscles which include the posterior deltoids and rhomboid muscles. 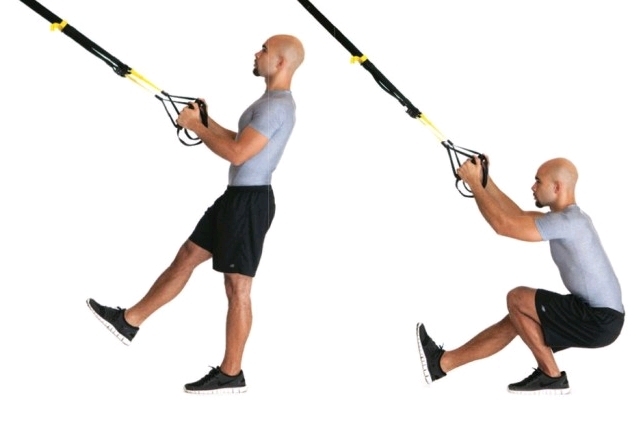 Start the exercise by standing in front of an adjustable pulley machine. This machine will be set just a little above your head level. You will attach one rope handle to this pulley clip. Hold on to one end of this rope handle in your hand and take a step back and extend your arms. Your torso shall be upright. Your abdominal muscles shall be braced as you do the workout. As you lead with the elbows, you can bend the arms and then move your hands in and towards the side of the head. From this position, you will slowly extend the arms and repeat the exercise. You will slowly learn how to maintain your balance as you get used to doing the workout. This is a simple exercise which is quite similar to a workout done by kids. You need to start the exercise by lying down on the floor, with your face down. Your arms shall be off the ground. Your palms shall be down for the complete movement, as you slowly sweep from above to your legs and then back again. You need to repeat at least 12 times. This is an easy exercise, quite suitable for beginners too. Once you get used to the ball circle workout, you should start with this routine. You need to have a stability ball on the floor. Keep your hands on either sides of the ball. You will slowly walk back till you are in a push-up-like position. From this position, you need to bend the arms and then lower the chest towards the ball. At this point, push back up and get back to your starting position. You need to do the required number of repetitions as you ensure that your scapula muscles are flat and firm against the wall. This exercise is just perfect for stabilizing the stabilizer muscles and building strength and power for better performance. Start by sitting comfortably as your back rests against the wall. Your feet shall be in front. Check that the soles of your shoes are touching one another. You need to now stretch your arms by you sides and keep your thumbs up. Try to touch the wall with your hands and arms as much as you are able to. You will feel the stretch in the arms at this point. Keep pressing the arms back so that there is constant pressure as you are able to raise them above your head. Get back to the start position. You need to do 12 such repetitions.